« Forget the paleo diet! How about the Mesozoic Diet? Will we ever detect gravitational waves directly? Gravity affects the shape of space and time. Paths of light and massive bodies curve under its influence. When something churns space-time with enough energy – say a supernova explosion or two black holes in orbit around each other – the distortion spreads out in ripples, like a rock dropped in a pond. Those ripples are called gravitational waves. These are very weak but, if the accelerating object has enough mass, it should be possible to spot them. At least, that’s what we suspect. Gravitational waves were predicted by Einstein’s general theory of relativity in 1916, and we’ve been trying to detect them ever since. While we’ve never measured these waves directly, we have lots of indirect evidence. In 1974, student Russell Hulse and his supervisor Joseph Taylor calculated that a pair of burnt-out stars spiralling towards one another were radiating gravitational waves at exactly the rate predicted by Einstein. This earned both researchers a Nobel prize around twenty years later. Any object in orbit around another will emit gravitational radiation, but in most cases this won’t be a lot. Gravitational waves ripple out from Earth as it orbits the Sun, but the amount of energy it loses over a period of billions of years is too negligible to be measurable. However, denser objects in the Universe – remnants of stars like black holes, white dwarfs, or the pulsars that Hulse and Taylor spotted – can have much stronger gravity and much smaller orbits, and therefore the energy loss can be very large. In fact, any sufficiently non-symmetrical body can make gravitational waves. A spinning smooth sphere (or even a squashed sphere, as long as it’s symmetrical) won’t make them, but a lumpy sphere will. If a pulsar has even a tiny mountain – distinctly possible if it is in a binary system – then the rapid rotation would noticeably produce gravitational radiation. Certain supernova explosions from extremely massive stars are also non-spherical, and would generate gravitational waves. In other words, we expect this radiation to be everywhere. So, why have we not detected it? A major part of the problem is that gravity is weak: even the strongest gravitational wave will only nudge an atom by a tiny amount. Additionally, the wavelength of gravitational radiation – the distance over which a wave repeats itself – is often similar to the size of the objects emitting it. So, while radio waves from pulsars may have wavelengths measured in centimetres, the gravitational radiation emitted could have wavelengths measured in kilometres. 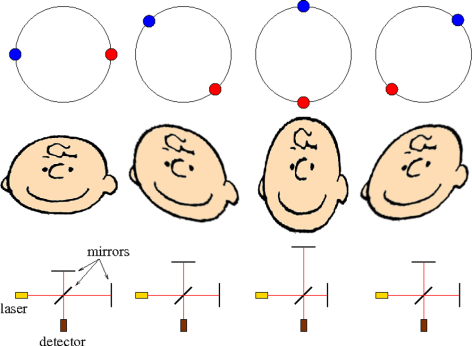 Which means that you most likely need detectors of a similar size to detect them. Last year, I visited the most sensitive detector on the planet: the Laser Interferometer Gravitational-wave Observatory (Ligo). 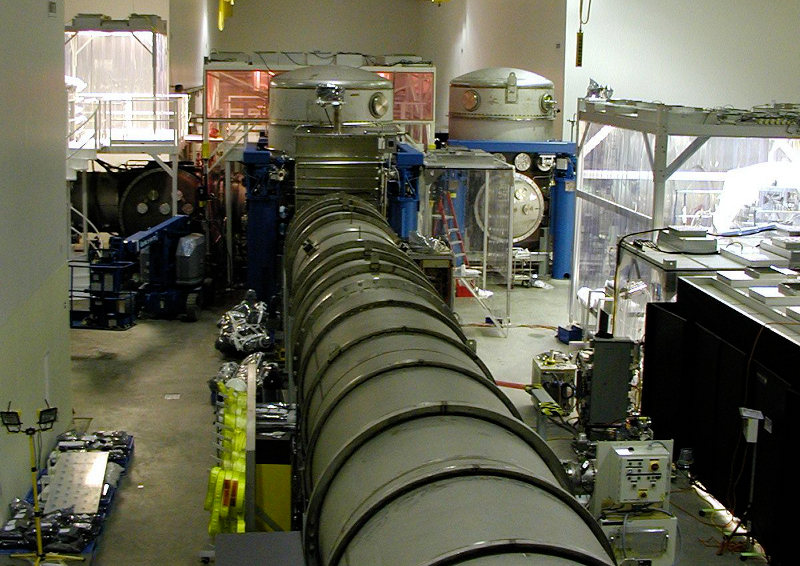 This instrument consists of two detectors, each L-shaped with arms 4 kilometres (2.8 miles) long. Powerful lasers shine down each arm, and inside each branch is a set of mirrors arranged so that when the light is reflected back, the peaks of one wave are in step with the troughs of the other, cancelling each other out (hence the name “interferometer”). As researchers Amber Stuver and Gaby Gonzalez pointed out to me, when a gravitational wave passes through the detectors, it changes the length of the arms by an amount smaller than the width of an atomic nucleus, but the detector is sufficiently sensitive to measure just such a change. But other things can slightly change the length of the arms, for instance, an earthquake or even a big truck sending vibrations through the ground. For that reason, a lot of the staff consists of engineers, including Céline Ramet, who showed me the equipment to keep things as still as possible. For Ligo, the problem is partly solved by having two detectors in the United States: one in Louisiana, the other in Washington, so they are separated by 3,000 kilometres (1,860 miles). The chances of a false positive signal in both detectors is much smaller; coordination with the similar detectors Virgo (in Italy), Clio (in Japan), and other observatories reduces the probability even more. So far, no waves have been detected in Ligo’s six years of operation, but astronomers say that a event is only expected to occur every 10 to 50 years within the region of space mapped by the detector. A new generation of detectors, called Advanced Ligo and Advanced Virgo, will be 10 times more sensitive, and scientists hope that they can detect something within a year of being operational in around 2015. The practical size limit on Ligo and other Earth-bound detectors means they are best suited for the end stages of binaries or supernova explosions. White dwarf binaries or paired black holes at the centres of galaxies would produce gravitational waves measured in millions of kilometres, impossibly large for detectors built on Earth. Building a significantly larger antenna on Earth simply won’t work, 4 kilometres is long enough that the arms of Ligo stick out of the ground due to Earth’s curvature, and going underground carries its own expenses and risks (though that’s the route the Clio detector takes). If you want to go bigger, you have to go into space. At this point, gravitational-wave researchers begin to swear and put their fingers in their ears. The reason is that a long-planned project called Lisa (Laser Interferometer Space Antenna), a joint effort between Nasa and Esa, has experienced many delays that were exacerbated when Nasa backed out entirely. The updated version, known as the Next Gravitational-wave Observatory (NGO), is a simplified design, but its launch date is currently unknown. NGO is based on the same principles as Ligo. The role of the arms is played by three spacecraft flying in a fixed V-formation, separated by 2 million kilometres (1.25 million miles), over 150 times the diameter of the Earth. 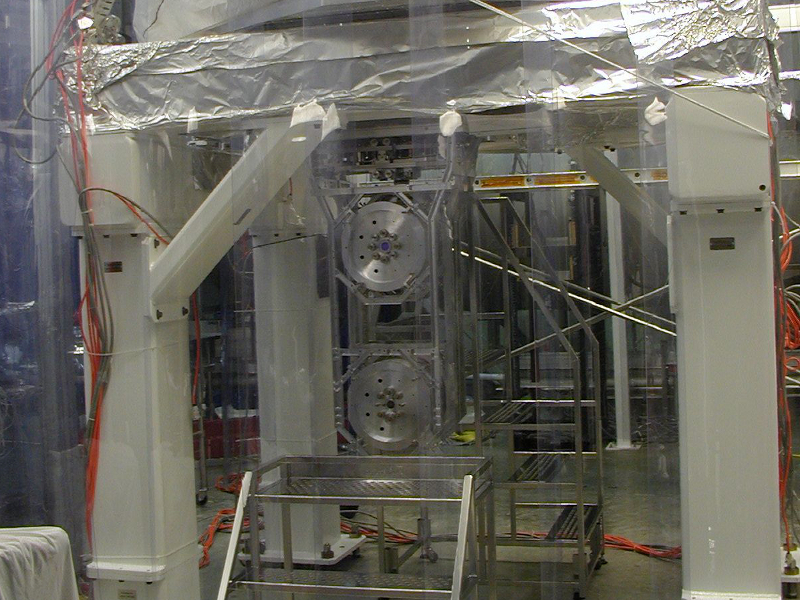 Mirrors inside the spacecraft move when gravitational waves pass. Isolation from noise found on Earth, as well as the much larger arm length, make NGO far more sensitive – and able to detect stable binaries. If NGO is completed and flies before I’m aged and grey, it will be our best chance to prove Einstein right, and possibly even find objects we haven’t predicted. Historically, every new way of seeing in astronomy has revealed something new to be seen, so it wouldn’t be surprising if gravitational-wave astronomy also has a few surprises in store. Several people asked me about pulsar timing arrays (PTAs), which are another method of gravitational wave detection using radio telescopes to measure fluctuations in pulsar signals. If they work as advertised (which I think they will), PTAs will be particularly sensitive detectors, but they won’t detect gravitational waves directly. Thus, my failure to mention them wasn’t neglect, since I wanted to focus on direct-detection schemes. PTAs cover a different frequency range than either LIGO or NGO, so they should still be seen as complementary instruments to direct gravitational wave detectors. The NANOGrav (North American Nanohertz Observatory for Gravitational Waves) PTA will feature in the final chapter of my book-in-progress, Back Roads, Dark Skies. The method of detection is just as direct as LIGO, just on a much larger (literally astronomical) scale. The signal we get from PTAs at Earth is still electromagnetic, not gravitational. It’s splitting hairs a bit, perhaps, but when I say “direct detection”, I mean literally recording gravitational radiation via instrumental response to the waves. PTAs can’t be a complete replacement for other detectors anyway, since they cover a different wavelength regime than LIGO or NGO. Again, this is not to denigrate PTAs in any way. PTAs are an awesome concept, and I’ll be writing more about them in the future. but the signal recovered by LIGO is also EM – they use lasers to measure the distortion of spacetime. It’s fundamentally the same. And yes, PTAs/LIGO etc are all complementary, I just think it’s unfair to claim that PTAs wouldn’t make direct detections. They would. If you think about the pulsar array and the Earth as the detector, I don’t see how PTAs don’t make just as direct a detection as their ground-based counterparts, even though that detection is mediated by EM waves. Doesn’t the Earth-pulsar system respond to gravitational radiation? Doesn’t LIGO use lasers to detect the instrumental response to gravitational radiation. I don’t mean to be confrontational — I’m just not seeing the difference here. Certainly both detectors are important, since they probe very different regimes on the gravitational wave spectrum, but one doesn’t seem intrinsically a more fundamental detector than the other.